When it comes to exercise equipment, most people are forced to choose between a cross trainer and an exercise bike. Esprit’s Fitness ACTIV-8 gives you the best of both worlds. The ACTIV-8 is a 2-in-1 machine that doubles as an elliptical cross trainer and an exercise bike. Plus, it comes at a price that’s almost impossible to beat. Does the ACTIV-8 offer a great workout? We will review this bike/elliptical to find out. LCD displays the time, speed, calories and distance for each workout. The Esprit Fitness ACTIV-8 is a great option for anyone who is just getting started with fitness or is looking for a versatile home workout machine. The ACTIV-8 can function as an exercise bike or cross trainer, so you can enjoy the benefits that both machines have to offer. 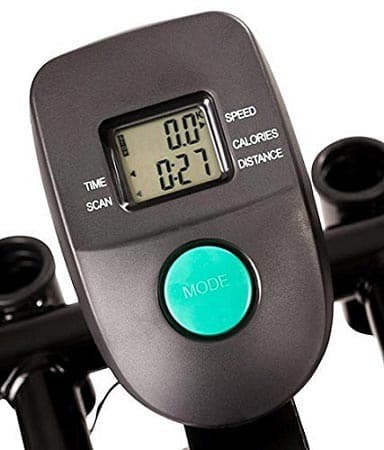 Rather than typical pedals found on most exercise bikes, the ACTIV-8 uses a platform. 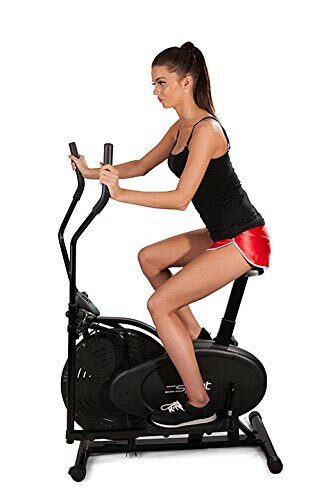 The dual-action platform can move both forward and backward to allow the machine to be used just like an elliptical cross trainer. With the ACTIV-8, you can burn five times more calories than walking. The machine’s adjustable resistance is part of the reason why you can burn so many calories. It also makes this machine an excellent choice for all fitness levels. If you’re a beginner, lower resistance levels will offer a challenge that will improve your stamina and conditioning. Over time, you can continue to increase the resistance to ensure that your workouts are challenging. The resistance can be adjusted with the simple twist of a button, which is located between the seat and the handlebars. The seat is also adjustable, so you can find a height that’s right for you. The adjustment mechanism is situated just below the seat for easy use. Between the padded handlebars is a console that features an LCD display. Here, you can track your speed, workout time, calories burned and distance. The console is simple in nature (it won’t save your workout results or create profiles), but it gets the job done. The ACTIV-8 is a pleasure to use and exceptionally quiet. It also features front wheels, so you can easily move the machine when it’s not in use. It’s important to note that you will have to assemble the ACTIV-8 yourself. All of the tools are provided, and assembly typically takes less than an hour. Free delivery is also available, which is always an advantage. The only issue that some users may have is inadequate resistance levels. For advanced users, the highest resistance may not be enough to provide a challenging workout. All in all, the Esprit Fitness ACTIV-8 is a great option for anyone who is just getting started with fitness or searching for an affordable cardio machine. You’d be hard-pressed to find another machine for under £100 that’s delivered for free and offers the same quality workout.